MONTECATINI OPERA FESTIVAL, one of the most relevant cultural events in town, expresses the genuine long-lasting link between this town and culture, specially music. bicentenary of Giuseppe Verdi’s birth, (4th September). 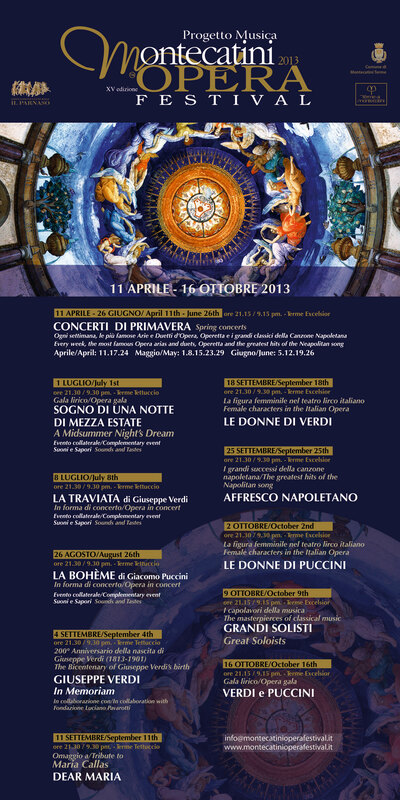 The season’s programme presents 22 events, from April to October, including two special selections of great operas enriched by costumes: LA TRAVIATA ( 8th July) and LA BOHÈME (26th August) – the latter not included in this year’s Puccini Festival of Torre del Lago – and a special event totally dedicated to the great singer MARIA CALLAS (11th September) performed by the splendid Greek soprano Dimitra Theodossiou.